Our October member meeting was held last week at the Ellsworth High School. During the meeting Executive Director, Russ Korpela presented a check for $4,000, to the Ellsworth High School to assist in meeting their FabLab Grant matching funds. The donation from the chamber was made possible through their various fundraising activities throughout the year including the Cheese Curd Festival and the Salute to Education Luncheon. The Wisconsin Economic Development Corporation (WEDC) awarded the district a $25,000 grant in April. A FabLab is a small-scale workshop that contains high-end computer numeric controlled (CNC) equipment. This year's grant and matching funds made the purchase of several new pieces of equipment possible including a large format printer vinyl cutter, a CNC Router, a CNC plasma cutter, and a metal roller. Exposing students to this state-of-the-art equipment prepares them for future careers and assists in training a workforce for local manufacturers and technology-based businesses. However, the FabLab and its equipment is an asset to district residents, too. For example, the CNC router was featured this fall in a community education sign-making class, where 14 participants were able to design and router wooden signs for their personal enjoyment. Phase 1 of the FabLab expansion will be complete by March of next year. Phase 2, with a targeted completion date of January 2019, will include the purchase of a larger laser engraver, a 3D printer, and a CNC milling machine. 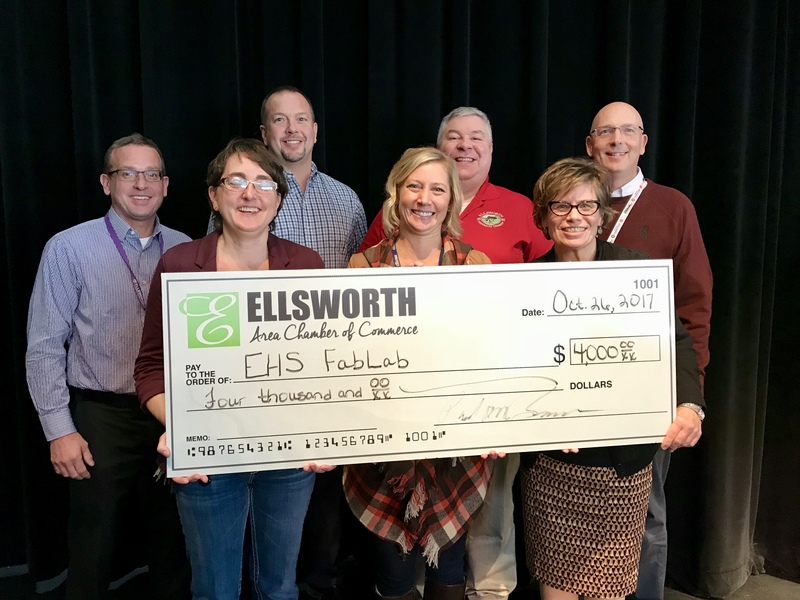 C​ongratulations to Ellsworth High School, recipients of a $4000 check for FabLab upgrade. Back row, left to right: Barry Cain, Ellsworth Community School District Superintendent, Doug Peterson, Ellsworth School Board President, Paul Bauer, Ellsworth Area Chamber of Commerce Board President, Mark Stoesz, Ellsworth High School Principal. Front row, left to right: Julie Winegar, Technology Education Instructor, Katie Feuerhelm, Ellsworth School Board Vice-President, Sue Beck, Ellsworth School Board Clerk.